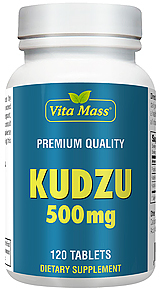 Kudzu Recovery features the roots and flowers of kudzu (Pueraria lobata), which have long been used in Chinese herbalism to help lessen the desire for alcohol. These are combined with coptis, a primary cleansing and liver-supporting herb from Chinese herbalism, and other key botanicals to support balanced blood sugar levels, anti-alcohol support. and enhance energy levels. Kudzu, a fast-growing plant often referred to as "the vine that ate the South" may be more than just a big, green nuisance. According to a recent study conducted by researchers at the University of Alabama in Birmingham, chemical compounds found in the kudzu plant have a number of important medicinal properties. In animal studies, kudzu root extract was found to blunt the usual rise in blood pressure that accompanies a high-salt diet. And in rodents with the equivalent of type 2 diabetes, kudzu compounds were shown to significantly reduce blood sugar levels and improve insulin sensitivity. Should additional studies confirm the beneficial actions of kudzu on blood pressure and blood sugar levels in humans, there will be plenty of plants to go around. The voracious vine currently covers more than 7 million acres of land in the southeastern states. In spite of its widespread distribution, kudzu isn't native to the United States. It was brought to this country more than a century ago, when the Japanese government delivered a charming horticultural display to the 1876 Centennial Exposition in Philadelphia. Americans loved the lush green leaves and the sweet-smelling flowers of the exotic-looking vine, and soon began mail-ordering kudzu plants to decorate their gardens and shade their porches. In the aftermath of the Depression, the U.S. government actually paid farmers to plant kudzu on their unused fields as a means of controlling soil erosion. In the highly favorable growing conditions of the South, kudzu spread like wildfire. The plant known as the "mile-a-minute vine" can grow up to a foot a day in the summer. While agricultural specialists are working hard to find ways to eradicate the weed, medical researchers are uncovering a growing list of therapeutic applications of the chemical compounds found in kudzu. In Asian countries, various parts of the plant have been used as ingredient in foods and medications for at least 2,000 years. In traditional Chinese medicine, the ground root and the flower are used to treat fever, headache and muscle cramps. Kudzu has long been included in herbal remedies designed to alleviate menopausal miseries, including hot flashes and mood swings. Recent studies have confirmed the presence of weak plant estrogens in the roots and flowers. Human intestinal bacteria act on these plant estrogens in the gut, increasing their potency. For some women, the estrogenic activity of kudzu-containing products can provide welcome relief from menopausal symptoms, minus many of the risks associated with traditional estrogen therapy. Kudzu may prove to be most beneficial for folks who want to cut back on their consumption of alcohol. When Harvard researchers tested it on golden hamsters that were genetically engineered to be "drinkers," they found that the rodents' alcohol intake was dramatically reduced. For the study, untreated hamsters were given a choice between water and alcohol, and their consumption of each liquid was measured. After treatment with kudzu, the hamsters' consumption of alcohol fell by more than half. The results of the hamster study prompted scientists to test the effects of kudzu extract on human drinkers. Researchers at McLean Hospital in Belmont, Mass., recruited 14 men and women, whose average age was 24 years, to participate in a new study. The laboratory was an apartment, complete with a television set, comfy seating and a fully stocked fridge. In the early stages of the study, each subject was allowed to drink up to six servings of beer to allow researchers to determine his or her normal consumption pattern.